Loosening restrictions on speed cameras, reforming New York City’s toll system, patching up broken hit-and-run laws — there’s plenty Albany lawmakers can do during this year’s legislative session to improve transit and make streets and roads safer. We asked advocates what issues they hope will get Albany’s attention in 2017. Here are some of the major ones they’ll be watching out for. Less traffic, fewer fare hikes, faster buses, and safer streets. The Move NY plan would do much to improve mobility and make the city’s transportation network function better for everyone. What it needs is the support of Governor Cuomo. The plan got a boost in 2016 when Assembly Member Robert Rodriguez introduced enabling legislation that picked up dozens of sponsors, but no companion bill was introduced in the Senate. A recent Transportation Alternatives poll found that 54 percent of New York voters prefer toll reform to other transit funding options. If Cuomo decides to make it a priority, Move NY could finally go the distance. The de Blasio administration will again press Albany for “expanded authority” to use speed enforcement cameras. Currently, the state limits the city to 140 cameras, which must be deployed near schools and activated only during school hours. Transportation Alternatives will concentrate on enlisting Cuomo’s support. If he chooses, the governor can protect New Yorkers from speeding drivers by prodding lawmakers to lift random restrictions that are holding the program back. State Senator Michael Gianaris’s office says he is again pushing two bills that would strengthen penalties for unlicensed drivers who harm people. S2484A — which passed the Senate in 2016 — would make it a class E felony to cause serious injury or death while driving without a valid license, as long as the license was suspended or revoked for traffic offenses. The second bill would require drivers with suspended or revoked licenses to surrender their license plates. Albany has a couple of opportunities to reduce hit-and-run crashes. One is an Amber Alert-type system proposed by City Council Member Ydanis Rodriguez. State Senator Marisol Alcantara and Assembly Member Carmen De La Rosa, who represent Upper Manhattan, say they will intro bills to establish such a program statewide. Then there’s the seemingly interminable quest to get Albany to fix state code that gives drivers an incentive to flee after a serious crash. Both houses managed to pass legislation to change the law in 2015, but the bill would have done more harm than good, and district attorneys and safety advocates had to lobby Cuomo to veto it. According to Nassau County vehicular crimes chief Maureen McCormick, a top priority of district attorneys this year is reforming laws against driving while under the influence of drugs. Due to a 2007 Court of Appeals decision, if a substance isn’t on the state’s list of drugs that are prohibited while driving — synthetic marijuana being one example — police and prosecutors can’t charge motorists for driving while intoxicated by that substance, even after a crash. “In addition, a defendant can refuse to submit to a chemical test unless there was death or serious injury,” McCormick told Streetsblog. McCormick notes that Cuomo’s 2017 State of the State book (see page 350) mentions closing this loophole. “There is a sliver of hope,” she says. A bill from upstate Senator Tom O’Mara would establish a three-foot buffer between cyclists and passing motorists — the current standard is passing “at a safe distance” — and would make a sideswipe collision prima facie evidence of the driver’s failure to pass with three feet of clearance. This would give police a tool to charge drivers in crashes like the one that killed Brooklyn cyclist James Gregg. Could this be the year New York aligns state law with federal law on electric bikes? Though the feds officially classified them as bicycles more than 10 years ago, New York still considers e-bikes to be motor vehicles. Since e-bikes don’t come from the factory with vehicle identification numbers (because VIN numbers aren’t required under federal law), they can’t be registered with the DMV, and are therefore considered unlicensed motorcycles. In NYC, this technicality gives police another reason to target delivery workers who use electric-assist bikes to make a living. The Senate passed a bill in 2015 to address the problem, but it died in the Assembly. Senator Martin Dilan and Assembly transportation chair David Gantt reintroduced e-bike legislation in their respective houses last month. The bills would limit top speeds to 20 mph and require users to wear helmets. I like everything except for speed cameras and e-bikes. Speed cameras are often miscalibrated, most of the money goes to private companies, and the process is rife with corruption. Instead, let’s instruct the police to spend a certain amount of time per day with a radar gun, and have them enforce the law. The e-bikes delivery people ride are not bicycles. They are heavy, fast and silent and have a throttle. Delivery people ride them on sidewalks and the wrong way in bike lanes and they’re dangerous. Pedelecs should be considered bikes, but not the throttle controlled ones. Those work exactly like mopeds and should be classified as such. I don’t like the helmet requirement for e-bike users. That still gives cops a reason to harass people riding e-bikes. in fact, it’ll probably result in faster riders on regular bikes getting pulled over for a no helmet if the cops think they’re on an e-bike. Frankly with so many bicyclists on sidewalk or going the wrong way I am opposed to ebikes. It is petrifying to see an ebike coming full speed at you on the sidewalk. As we are trying to slow down cars, we should not empower cyclists to go faster especially when they operate illegally. In most other countries they take away a driving lane and they ride there. In just under a year, you are going to vote on a constitutional convention. You really should know what’s going on! Although statistically, most New Yorkers don’t know what it is or what it does. Many public sector unions are against it because, with the political climate, there is a lot of talk of gutting public sector pensions. By gutting, do you mean no longer allowing pensions to be retroactively increased at 3 am in a political deal, and then never reduced even if it means public services are complete gutted despite soaring tax rates? With cuts and pay and benefits for future public employees? Do you believe the current situation is fair? In that case, do you believe Cuomo should have signed the additional pension increases the legislature passed this year? How about a 20/50 pension for the TWU, which they went on strike for in 2003, with an increase in benefit payments for the already retired to make up for the fact that some of them had to work to 55? I think it would be fair if public employees got the pensions they were promised when they were hired. And taxpayers funded those pensions at the time they were earned, rather than having politicians lie about what they cost to shift the cost to those younger as they laugh and leave town. And paid the same taxes on identical incomes as everyone else. I’m tired being lied to, cheated, and then lied to about the fact that I was cheated. I am a public sector employee with a public sector pension. I believe that employees should have the pension they were hired with unless the pension were to be renegotiated within collective bargaining. On this case, pension changes would be bargained as an offset for other things, such as pay increases. Which is one of the reasons there is a public sector pension – someone working in the public sector earns substantially less, pay check to paycheck, than their private sector equivalent. But the pension and other benefits make up for it, for the most part. Early retirement pension buy ins, like 25/55 are a way to encourage early retirement which is a coat reducer, rather than a cost increase. It is a way to encourage higher wage, end of career employees to retire to replace them with beginning of career, lower wage employees as a cost cutting program. Edit: and I should add, it requires the pensioner to contribute extra money compared to the regular system. That, of course, not what happened. 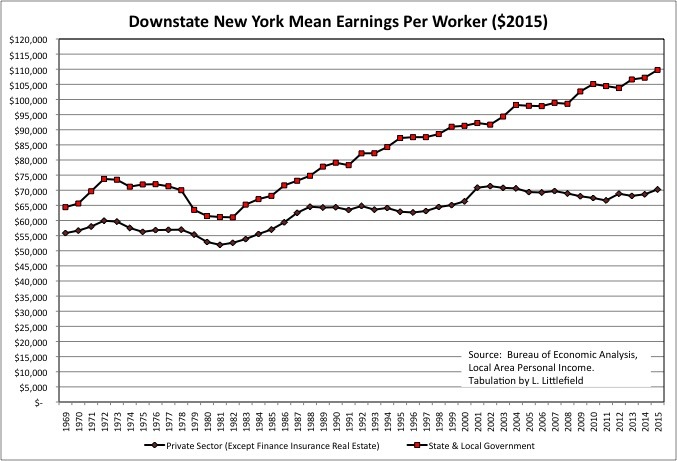 As a result of huge retroactive pension increases in 1995, 2000 and (for NYC teachers) in 2008, pension costs have soared. How much have public sector wages been cut, relative to private sector wages, to offset this? Not at all. And as for additional contributions, in 2000 when pensions were retroactively increased — for the already retired — pension contributions for most public employees were eliminated after 10 years. I don’t just say these things, or repeat things I decided in my 20s. No one has added up the numbers more than I have. Public sector workers who are cashing in and moving out are out of solidary with other workers, including more recently hired workers in other pension tiers. What they have done is analogous to what has gone on on Wall Street. Think of it another way—if e-bikes were legal many more people might use them on trips they currently use motor vehicles for. Would you rather have e-bikes or full-size motor vehicles given the choice? Also, the fact some people ride recklessly is something entirely separate from the type of vehicle they’re using. Far too many people drive recklessly in this city, and yet nobody is talking about banning motor vehicles. Legalize e-bikes (sans the idiotic helmet requirement), and use a combination of mostly better bike infrastructure, plus some enforcement, to deal with the issues you mention. One thing of note, as Larry mentioned, was the pension increases weren’t given conditionally for givebacks like maybe lower pay or higher productivity. Also, it’s absolutely ridiculous to also give these pension increases to already retired workers. For one thing, you’re spending more money but not gaining anything from it because these workers are already gone. For another, these workers already worked and retired under whatever terms they signed on for. Sure, the retirees benefit but who else does here? Usually if you give pension increase you use them as leverage to get something else from the same people who are getting the pension increases. Finally, my understanding is most of these pensions were already quite generous, equivalent to perhaps $25K or $30K annually in today’s dollars. Add in $10K plus is Social Security, and you have $35K or $40K. That’s plenty. My mom has been doing fine on a total of ~$35K between Social Security and pension. In fact, that’s actually about $10K more annually than what she spends on housing, food, and so forth. Remember retirees no longer have to commute to work, buy work clothes, or pay for raising children. They also generally live in paid-for houses, so their housing costs amount to just real estate taxes plus utilities. The real issue, which Larry mentions, is the fact you gave more money to people who were already retired on generous pensions at the expense of lower pay and benefits for those still working. If anything, you would want to do the opposite. You only have leverage over those still working (unless the UFT plans to ask those receiving the higher pensions to work part-time for the extra money, which I doubt). They were generous to begin with, but what was promised was promised. But the retroactive pension increases were extremely unjust, as unjust as anything that has happened here for the past 25 years and more damaging. Among other things, public employee pensions are destroying public services all over the country. And although Republicans are just as much to blame for the disaster, Democrats, associated with public employees, are getting it, which is why they are being wiped out of statehouses all over the country. If they are legal to use on the road, that would be a strong incentive not to use them on the sidewalk. I am a teacher and the changes to our pensions are not nearly what they are made out to be. First of all, pension changes for NYC teachers are NOT negotiated in our contracts. Our pension changes are statewide pensions that apply to all state employees. Secondly, from tier to tier in pensions, there is NOT an increase as many seem to think. From an outside perspective, it is possible to believe that tier 5 is better than tier 4, etc. But this is not the case. The secret is in the numbers based in how they are calculated. Tier 1 was the best pension and the “good old days” of pensions. Tier 2 changed the formula and there was a significant drop in payout to the retiree. Tier 3 is either fundamentally the same as 2, with minor changes. But I could be mixing that up and it might be fundamentally the same as 4. Tier 4 is a substantial decrease over Tier 2. Tier 5, the latest, is fairly similar to Tier 4, but is slightly diminished. As a teacher in the statewide pension system, the subsequent pension changes have not increased our pension payouts, but decreased them. However, we are also grandfathered into our pension tiers. Most of us currently teaching are Tier 4. The last Tier 1s retired about a decade ago. New hires in the past several years were hired in Tier 5. From our pension advisory sessions, the differences between Tier 1 and Tier 4 can amount to hundreds of thousands of dollars less per retiree in Tier 4 over Tier 1. In 2008, teachers were given the option to buy into a 25/55 pension plan that would give a payout 5 years earlier and after only 25 years instead of 30. This was a cost saving program put in place during the recession to replace teachers making 120k with teachers making 40k. But there was no windfall. Give backs doesn’t mean that someone making 75k has to start making 70k. Give backs mean that, if the gping increase would be a 4% per year increase, you take a 2% increase with some pension benefit. It is amazing that your mom is able to do so well on only 35k a year. It probably helps that she owns her own home outright. Someone paying a mortgage or rent would not be able to retire on that much. I pay about 15k a year just in property taxes alone. Add in utilities and condo maintenance, that is another 6 thousand dollars a year. So housing, alone, costs me 21k a year WITHOUT taking into account my mortgage. As for more money to retirees, this is not the case. Once you start collecting your pension, or retire before collecting your pension, your pension is set. The only thing that affects retirees is if there are retroactive raises. Teachers, for example, worked for about 6 years without a contract. After BdB came in, the UFT negotiated a contract with him that included 4% retroactive raises that were ordered by an outside arbitrator. That 4% for each if 2 years is being paid out over time, not in a lump sum. In order to collect the back pay, a teacher must either be currently working in NYC public schools or have retired. Anyone who moved in in any other capacity does not get the increase. The retirees who get the increase are only those who were currently working during the increase years and they only get the increase because it is back pay owed and their pension goes up because the salary their pension is based off of also has increased. But someone who retired I the years before this annual increase doesn’t see a dime difference in their pensions. Most pensions have annual cost of living increases tied to inflation and that’s it. Real estate taxes for us are about $5K. Utilities, which is electricity, water/sewer, Internet/phone/TV, and heating oil average perhaps $12K or $13K. Food is maybe $5k or $6K (including cat food and cat litter). Total then is roughly in the $25K area if you include a little for incidentals. Note that if I lived alone, I could do way better. I would turn off the central oil heat and use an electric space heater in whatever room I’m in. That would mean just using oil for hot water. I could drop my mom’s cell phone and the extra TV box. These things probably drop utilities to $8K or so. Food would drop to about half. Real estate taxes would be about $1K more without the Veteran’s and senior citizen credits mom was getting. All told my bills living alone for food and shelter would be around $17K or $18K annually. If I want to add $5K for incidentals, hobbies, and entertainment I’m still under $25K. My point is by the time you retire your condo should be paid so your mortgage is one big expense you won’t have. Also, there’s quite a bit of advantage to owning a home as opposed to an apartment or condo. You’re not at the mercy of landlords or the condo board raising rents or maintenance charges. It also helps that mom and I both grew up poor. I’ve made over $100K annually the last two years but I still live like I’m making $10K. I think long and hard even with purchases of a few hundred dollars. My last major purchase was the ~$1300 when I bought my titanium bike on eBay in 2011. I firmly believe in saving your prosperity for a rainy day. If you turned off heat, and used a space heater, your electric bill would go through the roof and your pipes would freeze. Even vacation homes need to keep their heat set at 55 in order to keep their pipes from freezing, unless all water pipes are drained before the first frost until after the last frost. The fact there’s tiers is an implicit admission the costs of the older tiers were unsustainable in the long run. As a result, new hires are stuck with a lower overall compensation package. This essentially amounts to a transfer of wealth from the young to the old. If pay and benefits were kept to levels which could be sustained by tax revenues, there would be no need for tiers. The problem isn’t that you’re making too much, but rather that those before you did. In fact, you’re probably making too little relative to what you might be had the city given less generous benefits to those who worked years ago. That’s usually because pension funds are often raided when they look really sunny, figuring that they will make up for them, and then they don’t. In the old days, pensions were more sustainable because bureaucrats kept their hands off and legislatures and governmental chief executives kept their hands out of the cookie jar. We already have one or two space heaters going now most of the time to keep mom warm. That would drop to just one if I lived alone, so the electric bill would go down, not up. As for turning off the heat, the house holds about 20 or 30 degrees above outside temperature without heat due to heat gain from the sun, plus heat used for appliances and lighting. It would have to average 5°F or less outdoors before there would be any danger of the pipes freezing. It just doesn’t get that cold in this part of the country. The coldest days typically average over 10°F (lows around 0 and highs of 15 or 20). Even on the coldest days, I doubt the pipes would freeze. The basement rarely gets under 50°F even on the coldest days without heat. If there is a danger of freezing, I could always put the thermostat at 50 or 55. That’s really a bad habit politicians have gotten into. Things like pension funds, transit taxes, and so forth need to be put into a proverbial lock box even if the investment returns exceed what’s needed to fund them. You could always use the surplus funds to fund obligations during an economic downtown. Of course, most politicians (and most Americans) don’t believe in saving money for a rainy day. It’s spend, borrow, spend some more, borrow some more. I already have when my mom wasn’t home. On days when it was in the 30s during the day and teens at night the house stayed over 50°F. A space heater in whatever room I was in kept it comfortable. Obviously if I retire with enough money I won’t need to take drastic measures like this but my point is I could if I really needed to cut costs to the bone. I’d probably still be under $20K even keeping the heat on in the low 60s. Pensions weren’t widespread before WWII. UAW didn’t get a pension out of the automakers until 1949/1950. Retirement was at 65. Life expectancy for a 30 year old male in 1950 was another ~40 years. Hasn’t increased 10 years since then. pensions were more sustainable because bureaucrats kept their hands off and legislatures and governmental chief executives kept their hands out of the cookie jar. When do you think it worked like this? Speed cameras are often miscalibrated, most of the money goes to private companies, and the process is rife with corruption. Sources for those three assertions (that apply to New York City in particular)? I can’t find the contractor who NYC use, which is kind of weird. The fee structure is flat fee (a good thing) but the business is very shady in general as demonstrated in Chicago, Phoenix, and other locales. you can get his just as fast with someone on a regular bike genius.dont target bikes for no logical reason. and yes the cities crack down on atvs is a no brainer that should have been majorly enforced already. your grandmother could take a hill on an ebike she normally would not have on a regular bike, if she biked. so could the one legged vet. Back in February we asked safe streets and transit advocates what they wanted to see state legislators get done in 2017. The session has now come and gone, and lawmakers have delivered on none of those initiatives. Here's our recap of Albany's 2017 so far. Read it and weep. Support is highest in Staten Island, followed by Queens. The result in Queens is especially noteworthy, since political resistance to Mayor Bloomberg's unsuccessful congestion pricing efforts in 2007 and 2008 was concentrated in that borough.